A few minutes into his 10 minute speech opening Apple’s 2013 Worldwide Developers Conference (WWDC), Apple CEO Tim Cook did something remarkable—he gave up the stage to a previously unknown startup called Anki to demonstrate a car racing game. Of course, it wasn’t just any car racing game. Anki Drive is an impressive combination of robotics and artificial intelligence run on Apple’s mobile operating system iOS. And more, it’s a demonstration of how these technologies are poised to finally make it out of the lab and into the real world—into consumer products we all can use and enjoy. If Cook’s actions were remarkable, Anki’s story is their equal. Anki’s robotics and artificial intelligence platform—which can be applied to more than just cars—is five years in the making, and until yesterday, had been a complete secret. Even so, behind the scenes the firm managed to raise $50 million in two funding rounds and includes investments from Andreessen Horowitz (Mark Andreessen sits on the board), Index Ventures, and Two Sigma*. That’s a significant investment for a company with no publicity and no finished product. Andreessen said in a recent blog post that Anki is “the best robotics startup [he has] ever seen.” Keeping Anki secret since Andreessen’s first investment last year was one of the hardest things he’s had to do since starting his firm. You just don’t get this kind of behavior from Silicon Valley’s grizzled veterans. Measured optimism about a new product? Sure. But not unbridled glee from one of the biggest venture capitalists on the planet and a spot on one of the brightest stages in tech. 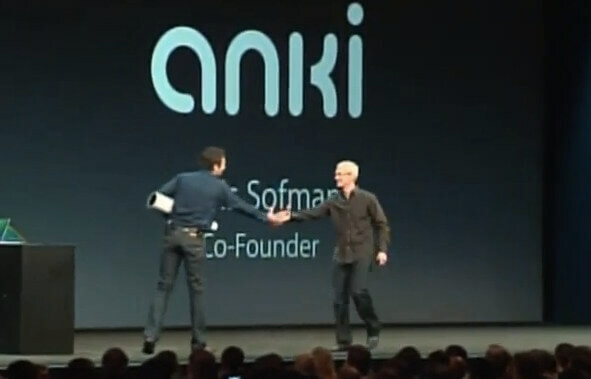 What exactly is Anki then, and how’d they get to WWDC? To find out, I spoke with co-founders Hanns Tappeiner (president) and Mark Palatucci (chief product officer). Foremost, Anki’s first product, Anki Drive, is a racing game, where miniature self-driving cars zoom around a physical track at top speed. It’s a real world video game. The cars in Anki Drive are equipped with a full suite of high-tech sensors and artificial intelligence allowing them to drive themselves around the track. The cars can pass, run other cars off the road, or even (virtually) shoot at one another. The game is currently in beta, but folks with iOS can download the app to learn more and participate in trials, and the firm hopes to make the consumer version available this fall in the app store and Apple retail stores for about $200. Buyers will get the hardware (presumably, track and cars) and software enabling gamers to race the computer, each other, or a combination of the two around a track in their living room—using only an iPhone or iPod touch. How does Anki Drive work? Palatucci and Tappeiner weren’t ready to get into the nitty-gritty details just yet. But the general concept should be familiar to SH readers. Google’s autonomous car operates on a similar premise. Tappeiner says, “We’re solving the same types of problems, but we’re doing it in a very different way because [our tech] needs to work for a consumer product.” As you might expect, getting cars to drive themselves is a pretty difficult problem. Palatucci, Tappeiner, and Boris Sofman (Anki co-founder and CEO) met back in 2005 in the PhD program at Carnegie Mellon’s Robotics Institute. But it wasn’t until the smartphone revolution got underway in 2007 that they realized component prices were falling enough to realistically bring artificial intelligence and robotics out of the lab. Anki started as a nights and weekends project in 2008. By the end of 2009, the trio had solved some “really hard problems,” and after showing their prototype to a few folks, they decided to start a company in 2010. What were those problems? Solving for position, reasoning, and execution. Each car needs to know where it is on the track relative to the other cars; it needs to make a decision on that data; and then it needs to take action. Solving all three of these problems is challenging enough, but to be useful, the cars need to precisely run through this process hundreds or potentially thousands of times per second—if they don’t, their decision-making data will go stale, and the cars will be halfway around the track before they make a move. Needless to say, Anki’s platform does just that. *Full disclosure: Singularity Hub founder and editor, Keith Kleiner, is an investor in Anki.